Looks can be deceiving. On the outside on a beautiful 70 degree day, the inside of a vehicle can heat to over 100 degrees in just a few moments. In a very short time, a pet left in a vehicle on a warm day can succumb to heatstroke and/or suffocation and die. Even in the shade, on a 78 degree day, temperatures in a car parked in the shade can exceed 90 degrees – and rise to a blistering 160 degrees in the sun! Even with windows cracked open. Never leave pets or children in parked cars even for short periods of time, even if the temperatures are in the 60s. Rolling down windows and parking in the shade will not guarantee safety or protection, since temperatures can quickly climb into the danger zone. 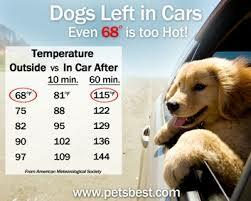 Many people ask about leaving a pet in the car with the air-conditioning running? This is still extremely hazardous. For example, in 2003, a police dog in Texas died after the air conditioning in the patrol car shut down and began to blow hot air. The air system’s compressor had kicked off because the engine got too hot. Newer model automobiles have computerized functions, and are prone to the same problem. In less than 30 minutes, a North Carolina couple lost two of their beloved dogs, and nearly lost a third, as a result of a similar vehicular failure in the hot August sun. In many states it is against the law to leave a dog in a car after the temperature reaches a certain point. Owners and pet sitters can be held legally accountable and pay fines or be incarcerated for neglect and abuse of their pet, even in the most innocent of situations when a dog is left in the car for even a few minutes. More recently a pet sitter/dog walker is under prosecution after six pets left in her care were left in a vehicle and died due to heat exhaustion after being left in the vehicle. Dogs are not able to sweat like humans. Cats and dogs cool themselves by panting and by sweating through their paws. They can go into duress and collapse, suffer organ failure, brain damage and potentially die of heatstroke. In just 15 minutes, an animal’s body temperature can rise from a normal temperature to one of deadly levels that will damage the nervous and cardiovascular systems, often leaving the animal dehydrated, comatose, and at risk of permanent impairment or death. What should you do if you see an animal or child in a car on a hot day? Take down the car’s color, model, make, and license plate number. Have the owner paged in the store and call animal control/police. Have someone keep an eye on the animal, or child. Don’t leave the scene until the situation is resolved. If police are unresponsive or too slow and the dog’s life appears to be in imminent danger, find a witness (or several) who will back up your assessment, take steps to remove the suffering animal, and then wait for authorities to arrive. Leaving an animal in a vehicle on a warm day is like placing them in a furnace. At highest risk are puppies to 6 months of age; older large breeds 7 years and above; small breeds 14 and above; dogs with short muzzles/snouts; ill-over exerted; black or thick coated dogs; dehydrated; or any existing medical conditions. If you think your companion is suffering from heatstroke, immediately remove him or her to a cool, shady location. Try to slowly lower the animal’s temperature by placing in cool, not cold, water; apply ice to head and neck area. ; GET TO THE VETERINARIAN AS SOON AS POSSIBLE AS FOLLOW-UP CARE IS CRITICAL TO HIS/HER WELL BEING. LOOK FOR: rapid panting, bright red tongue, red or pale gums, thick, sticky saliva; depression, weak/dizzy; vomiting/diarrhea; shock; coma.